The immediate past National Publicity Secretary of All Progressives Congress (APC), Alhaji Lai Mohammed, has asked a Lagos High Court sitting in Ikeja to stop the Peoples Democratic Party (PDP) spokesperson, Chief Olisa Metuh, from further making “libelous” statements against him. The former APC spokesperson, who made the plea through his counsel, Wahab Shittu, prayed Justice Toyin Ipaye to grant his prayer as a matter of urgency. 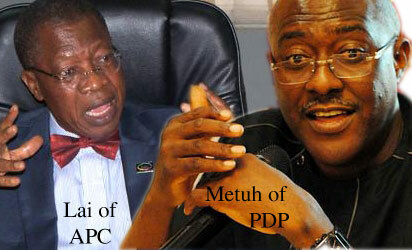 Mohammed, who is now the Minister of Information, had on October 12, 2015 filed a N500 million suit against Metuh before the court, alleging that the PDP spokesperson defamed him in a statement issued on September 20, 2015. He claimed that Metuh accused him of embezzling the funds meant for fencing of an airport as well as obtained money to supply ambulances, but which he allegedly failed to supply. Both alleged acts of corruption, according to the PDP spokesman, involved APC-controlled states in the Southwest. At the resumed hearing of the matter yesterday, Mohammed brought an application dated November 8, 2015, urging the court to “refrain the defendant, his agents, groups or associations from further publishing a libellous writing against the applicant pending the hearing of substantive suit”. “We need a stop gap of this court. The claimant is accused of corruption and embezzlement, meaning the claimant is a fraudster and an economic saboteur. “This is a claimant who has not been arraigned or found guilty of any corrupt practices and a legal practitioner of great standing. He is currently serving as Minister of Information. “The claimant’s legal right has been violated and is threatened by the defendant who seems to be on rampage. The defendant should be restrained from further publication of libellous statements”, Shittu posited. But counsel to Metuh, Emeka Etiaba (SAN), prayed the court to strike out or dismiss the application of the applicant for incompetence. “The application was not served within five days and there are no facts supporting the alleged libellous statement against the claimant. “It was also not duly signed by the deponent, but the signature of the deponent was scanned…” Etiaba argued. The trial judge adjourned the matter till November 23 for ruling.